The second of three regional summits focusing on water rights trading and investment in water resources will take place in Santa Barbara, California, on April 12th & 13th. The events, jointly hosted by American Water Intelligence and WestWater Research, will bring together leaders from industry, finance and government to discuss the commercial opportunities relating to water transfers and water resource development. The Santa Barbara event is titled "The Water Resources Investor Event". It will look at business solutions to the water resource issues faced by the State of California and examine the wider topic of water as an investment class. The second of three regional summits focusing on water rights trading and investment in water resources will take place in Santa Barbara, California, on April 12th & 13th. The events, jointly hosted by American Water Intelligence and WestWater Research, will bring together leaders from industry, finance and government to discuss the commercial opportunities relating to water transfers and water resource development. The Santa Barbara event is titled The Water Resources Investor Event. It will look at business solutions to the water resource issues faced by the State of California and examine the wider topic of water as an investment class. The Water Rights & Trading series places a large emphasis on networking and interaction among delegates, and the events offer opportunities for legal professionals to gain CLE credits. *American Water Intelligence (AWI) is based in Austin, Texas, and publishes American Water Intelligence, a national monthly magazine for professionals in water and water-related industries. 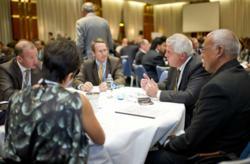 In addition to the regional summits above, AWI also hosts the premier financial conference for global water industry. The Global Water Summit Brave New World will be held in Rome on the 30th April to the 1st May. For more information please visit http://www.watermeetsmoney.com. *WestWater Research (WWR) is the premier advisory firm in the water rights industry. WWR specializes in water transaction advisory services, water investment and marketing services, water valuation, and water resource economics. Over the last 10 years, WestWater has forged new approaches to water markets through the development of innovative contracting solutions, unique marketing approaches and in-depth water trading analyses. WWR maintains the largest high quality database of water right transactions covering the western U.S. to assist private and public sector clients in making well-informed decisions.